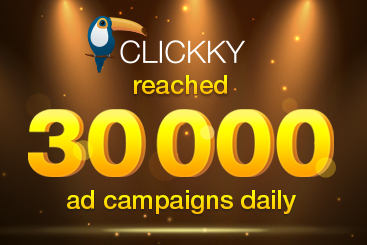 Clickky reached 30 000+ ad campaigns daily! Clickky has been rapidly growing over the past few months. We have reached over 30 000 ad campaigns daily. We passed the last milestone – 20 000 ad campaigns in January, 2016. We are constantly growing, aiming to create the most efficient and easy-to-use mobile marketing platform. Our main goal is to provide our clients with the best services possible. Last year we made several big steps towards our goals and significantly increased our growth dynamics. Learn about Clickky 2015 success in the following infographic. This year Clickky ranked #11 in in the Inc. 5000 Europe list of the most fast growing private companies.